Recognition makes the team feel really good about themselves. 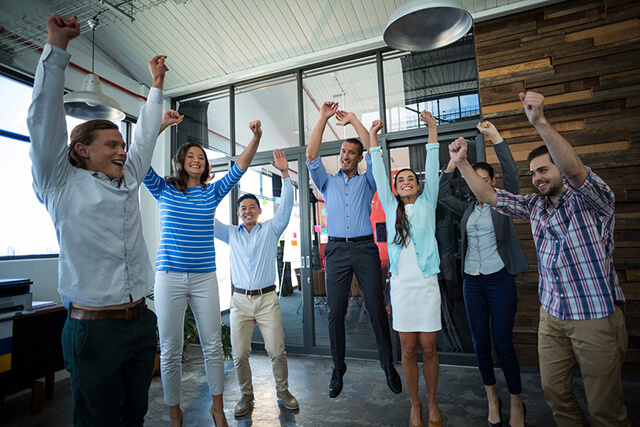 Furthermore, it also motivates employees to keep up the good work, and that is why rewards are a powerful weapon used for employee engagement. Everyone deserves to feel appreciated by their employer. Positive reinforcement sets an excellent example for everyone in your company. Rewarding and recognising your employees effectively is critical for maintaining top talent and keeping employees comfortable. Giving the employees the ability to make their own judgment without your involvement or choosing employees to take the lead on important responsibilities, shows them that you believe they’re up to the task. The amount of obligation you give to an employee should directly relate with how capable you believe they are. This shows that you take their career intentions seriously, and they’re worth your consideration to move up or take on a more important task within the company. Using meaningful praise is the easiest way to show that you care, and everyone will appreciate that and to crown it up, plus, it won’t cost you a dime. A private conversation showing how much you value an employee’s efforts or the old school, but effective handwritten thank you note – especially when it’s written by the boss, will create a long-lasting statement about performance while keeping your employees on the right track and developing engagement. Steer away from general praise cards or generic emails, as these will spoil the gesture and feel more like a necessity than proper recognition. This is a wonderful way to reward everyone at a go. There are different software solutions in the market that will assist you to provide a gamified experience, which is engaging and socially safe to employees. Deciding on indoor team building activities in Singapore will add a new level of interest to everyday tasks which will not only boost your engagement but also set a competitive, fun, environment for your employees. It really depends on the employees, but if they’re fun seekers, take them to outdoor activities like kayaking, skydiving, and others, that will love. It will make them feel less like that they’re being forced to work hard without being noticed. It doesn’t matter what game you pick; it could be anything as simple as a movie ticket or take your employees out to lunch and let them select the location; they will appreciate the effort you took to make their workplace a little more interesting. When celebrating the beginning of another and the end of one year, an office party can be a fabulous reward choice. Office parties are excellent because it gives people the opportunity to feel appreciated and let their hair down, too. You can also make your employees feel even more special on their big day by throwing a small party or hosting a team lunch – there are various simple ways to show that you care. You can also provide catered meals during significant business times to show your employees that you value everyone rising to meet the occasion. Find any reason and have a simple, inexpensive employee appreciation event such as going for singing sessions at karaoke in Orchard Singapore. This will strengthen the idea of continuous appreciation. Employee rewards are like investing, if you put a little in, you’ll get more back. Let your team understand that you recognise their hard work and can even become a part of your company culture. They will be motivated and look forward to the coming year, and you’ll get more dedicated and engaged workforce.